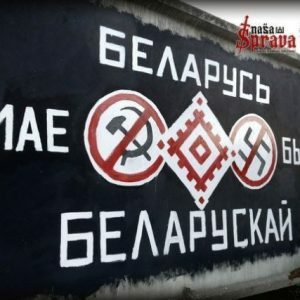 BelarusDigest > All > Freedom of expression: why do Belarusian authorities fear graffiti? On 22 December 2016, three Belarusian street artists sued an investigative committee for unfounded accusations of hooliganism. On 13 January, the court rejected the claim, pointing to the absence of any violations of the artists' rights. Street art has became a new form of political expression. The disproportionate reaction of authorities to street art is reflected in administrative punishments, harsh beatings, and regular KGB checks. Freedom of expression in Belarus remains highly restricted. Positive changes in visa policy, a decrease in political repression in 2016, and the release of six political prisoners in 2015 have raised hopes that the country is liberalising. However, as the prosecution of graffiti artists demonstrates, Belarusian authorities are still unwilling to make concessions to citizens and open up spaces for free expression of ideas. Street art has become a tool for expressing and illustrating political views in many European cities. However, Belarusian streets are different than in Europe in that they have almost no graffiti. Illicit paintings in Belarus survive for no longer than a few days or sometimes even hours. Authorities usually prosecute street artists for political paintings according to article 339 of the Criminal Code on ‘hooliganism’. The first graffiti case to elicit a disproportionate reaction occurred in 2005. The youth activist Artur Finkevich faced 12 years of imprisonment and spent more than 20 months in jail for writing the anti-Lukashenka slogan 'We want a new one (instead of Alexander Lukashenka)!' on the wall of a building in Minsk. Human rights defenders recognised Finkevich as a political prisoner who had been prosecuted for his active political position. In 2015, street artists painted a bird in a cage, symbolising the fight of Belarusian journalists for their rights, on a building in Vitebsk. A short time after, the piece was covered in grey paint. Nevertheless, journalists who managed to photograph the painting received fines for participation in a so-called unsanctioned strike action. Later, local authorities agreed that the painting was just an art piece and the photo-shoot was not a strike. However, journalists and human rights defenders believe that the authorities saw the graffiti as ‘ideologically dangerous’. In 2016, an unknown artist in Minsk added thorns on the garland and bouquet of a girl and boy painted onto the face of a building. Initially the street art, painted by a Russian artist in the style of socialist realism, aimed to depict the friendly relations between Russia and Belarus. Minsk authorities are currently preparing a court case against the painter, whose name has not been disclosed to the public. One of the most famous graffiti cases occurred in August 2015, when the investigative committee started a criminal case against the three street artists Maksim Piakarski, Viačaslaŭ Kasinieraŭ, and Vadzim Žaromski. The civic activists were threatened with imprisonment for one to six years for two instances of graffiti and damaging a billboard with colour. Their graffiti message conflicted with state ideology, and therefor led to a criminal case, as the human rights centre Viasna remarked. One painting stated ‘Belarus should be Belarusian’, while the other read ‘Revolution of Consciousness’. Violations of the artists' human rights during their detention and the disproportionate sentences they received led to a public outcry. In the end, the street artists received fines totaling 25, 000,000 BYR (around 1000 British Pounds). With the help of Art Siadziba, the activists gathered the money through a public campaign. Human rights defenders classified the street artists as political prisoners. Ales Bialiacki, the head of the human rights centre Viasna, commented to Radyjo Racyja that any form of civic activity in Belarus which contradicts official state ideology is punishable by the state. On 22 December 2016, the three graffiti artists initiated a claim against the investigative committee for falsely accusing the artists of extremism and hooliganism. According to the investigative committee, Maksim Piakarski, Viačaslaŭ Kasinieraŭ and Vadzim Žaromski had published extremist material, including propaganda of violence against the police. The artists first aimed to prove the accusation false and show that the committee had violated the disclosure principle. Moreover, The committee had released photos of extremist materials which according to the painters has no relation to them. The proceeding, held on 13 January 2017, was short. The court decided that the painters' rights had not been violated, in accordance with a decision by media law and the criminal code. Why do Belarusian authorities perceive street as a threat? Regular restrictions of rights, the prosecution of civic activists, and violations of freedom of speech, as in the case of John Silver, who suffered during detention and received personal threats to himself and his family, hardly surprise anyone familiar with Belarusian politics. However, punishing street artists for expressing their thoughts through graffiti is a new form of oppression. The court decision regarding the case of graffiti artists versus the investigative committee is evidence of Belarus's oppressive system. Expressing political opinion through street art would be unlikely to mobilise citizens to protest against the regime. However, the practise of repressing dissidents, such as bloggers, anarchists, and graffiti artists reflects the state's fears: graffiti with political slogans attracts a great deal of attention in social and mass media. In this way, authorities perceive street art as a form of protest equally dangerous to demonstrations or strikes. The ongoing prosecution of citizens who express their political opinions through the arts indicates that political repression in Belarus, despite the release of political prisoners, is ongoing. The state will most likely continue mainly to protect the political status quo rather than protecting the rights of citizens. The year 2016 left Belarus with a serious economic problem: its unresolved dispute with Russia over energy. On 9 January 2017, the Russian daily Kommersant revealed that Moscow will reduce oil supplies to Belarus from 4.5 to 4m tonnes in the first quarter of 2017. In doing so, Russia is pressing Belarus to pay its $425m gas debt. Simultaneously, Belarus announced the discovery of a new oil field on its territory. Unfortunately, its own oil reserves allow for 1.6m tonnes worth of production annually, while Belarus needs around 25m for its refineries. Oil products remain Belarus's No.1 export commodity, making a third of Belarus export revenues. With no alternative options for hydrocarbon supplies and Minsk's decreasing political and security leverage, the country will have to play by Moscow's rules. On 3 January, the Belarusian official media outlet BelTA reported the discovery of a new oil field in the Rečyca district in southern Belarus. The field, however, is classified as hard-to-reach because of its depth. Preliminary research estimates the volume of the field at around 850,000 tonnes of oil. 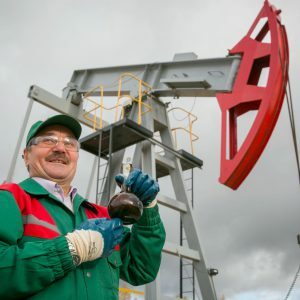 Totally, Belarusian oil reserves are estimated at 50m tonnes, although larger fields may exist, as Minister of Natural Resources and Environment Protection Andrej Kaŭchuta has claimed. Belarus extracts around 1.6m tonnes of oil on its territory annually. This amount is tiny compared to world oil production leaders. Russia, for example, produces roughly the same amount daily. The capacities of Belarusian refineries, however, require an additional 24m tonnes per year, which the country traditionally buys in Russia. Processing Russian oil and the export of oil products has guaranteed economic stability for Lukashenka for almost two decades. However, the Putin era brought regular oil and gas tensions, which forced Belarus to seek alternative supplies. Belarus even resorted to importing oil from Azerbaijan and Venezuela in 2010-2011 and 2016, as well as re-examining its own reserves. In 2016, Belarus and Russia participated in another oil war. However, this time around events are unfolding in a new political context and its results are less obvious. The Russian media have attacked Belarus for alleged turning to the West and redundantly striving for independence. It has also attacked its policy of 'soft Belarusianisation', all of which calls to mind the 'Ukrainian scenario'. Russia’s food safety administration consistently bans Belarusian food exports for various reasons. Moreover, the cut of oil supplies from Russia has hit the receding Belarusian economy heavily and created serious concern for Belarusian leadership . On 9 January, the Russian daily Kommersant revealed that Russia will cut oil supplies from 4,5 to 4m tonnes in the first quarter of 2017. In doing so, Russia is trying to persuade Minsk to pay its $425m gas debt. According to previous arrangements, Belarus was expected to receive a total of 18m tonnes of oil in 2017, but the sides failed to conclude a deal on Belarus’s gas debt by the end of 2016. The dispute started in January 2016, when Belarus demanded that Moscow reduce its gas price for Minsk because of falling prices on the global market and the inability of Belarusian industries to compete on the Eurasian Economic Union market because of unequal energy prices. Russia denied the claim, and Belarus unilaterally decided to pay less, accumulating a debt of $425m by the end of 2016. Moscow responded by putting conditions on the gas debt by limiting the amount of oil supplied to Belarus, a crucial resource for the Belarusian economy. A planned 5,3m tonnes per quarter contracted to 3,5m and finally to 3m tonnes in the last quarter of 2016. Before 1 January 2017, the sides were close to a deal but failed to finalise it. As a result of supply cuts, in January-October 2016, Belarus exported 15% less oil products compared to the same period of 2015, and 38% less in terms of money, which became a significant blow to the Belarusian budget. No way out of the oil trap? Belarusian-Russian relations saw a number of oil and gas wars in the 2000s, which usually ended in mutual concessions. Although Russia's image suffered as a result of these wars, it always retained a stronger position in negotiations. Reductions or delays in oil supplies are inevitably extremely costly for Belarus, as oil products have been its No.1 export commodity for decades. Oil production exports make up around a third of Belarus's exports, which makes the country vulnerable to global market fluctuations. Faltering oil prices hit Belarus heavily, as the adjacent diagram shows. Oil revenues peaked in 2012, with $16,4bn of revenues, and have steadily declined since. In 2016 Belarus received only $6,1bn from oil sales, a $10bn difference from 2012. Moreover, there are still no viable alternatives to oil and gas supplies from Russia for Belarus. Minsk attempted to teach Russia a lesson by importing oil from Venezuela and Azerbaijan in 2010-2011, when it received around 1,5m tonnes of oil by sea via the Ukrainian port of Odessa. During the new hydrocarbon war, Minsk imported 85,000 tonnes of Azerbaijani oil in autumn 2016, and Lukashenka revealed that Belarus was negotiating oil supplies with Iran. However, the negotiations apparently led to nothing, and Azerbaijani oil cannot cover the deficit of a few million tonnes of oil. The experts considered imports from outside Russia to be an economically unfeasible option. However, regardless of the direct gains, Minsk managed to secure better terms in its oil deals with Moscow by using these alternative deliveries as leverage, according to Vice Prime Minister Uladzimir Siamaška. But the current context of the Belarus-Russia disagreement have changed significantly since 2011 and Belarus became much more vulnerable economically, while Russia continues to assert its influence in the region and globally. Can Minsk counteract the Kremlin’s pressure in this new context? There seems to be little chance for Belarus to gain an upper hand in this conflict. Russia needs political allies less and less, as it increasingly relies on itself. This means that the strategy of 'brotherly rhetoric' in exchange for economic gains does not work anymore in Belarus-Russia relations. Besides, Russia is taking steps in the military sphere to ensure its independence from the Belarusian army on the western front. This significantly reduces Minsk’s leverage and restricts Lukashenka’s tricks with the Kremlin. With no alternative options for energy supplies and a heavy economic dependence on Russian resources, Belarus will have to play according to Russian rules for the foreseeable future.